The first time anyone sees our apartment the first thing they ask is always the same. 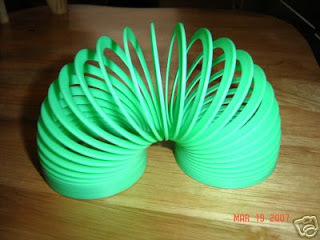 The Slinky once belonged to Jeffrey, a guy from school I went on a date with once. He knocked on the door, and when I opened it he said “Hey, watch this,” walked over to the stairs, and proceeded to take out the slinky and set it in motion. I introduced him to everybody and then the three of us, Me, Jeffrey and the Slinky, went down the stairs and out the door. I thought it was just a weird icebreaker type thing until we got to dinner and he kept playing with it. He had it slinking from the table to his chair, from hand to hand and on every step-like surface he could find. We stopped twice on the way back so he could try it out on two different sets of stairs. When we got back to the apartment, I wasn’t sure what to do. I definitely didn’t want to invite him back up, but when I stopped at my door he didn’t even pause before going in and up the stairs. He got up all the stairs before me, and when I reached the landing he was watching the Slinky descend from the 7th floor. I said goodnight and walked in, but much to my dismay, he followed me. I walked into my room to put my bag down, and he finally decided to pay attention to me. He put the Slinky down and kissed me. When I didn’t kiss him back and told him I was tired and I would see him in class tomorrow he got angry with me and stormed off without his Slinky. When I recounted it to the others the next day and showed them the Slinky, Scott had an idea. And with that he took the Slinky and tied it around the lampshade in the corner of the living room. It wasn’t until later that night that we realized it was also a glow in the dark Slinky.